Menopause has a lot of different symptoms, but some you hear about more than others - like hot flashes, night sweats, mood swings, vaginal dryness, loss of libido, anxiety, panic attacks, dry skin, and electric shocks. Wait, you mean you haven't heard of that last one? Symptoms like this are less common, but definitely not uncommon. So if you're experiencing the more uncommon side effects of menopause, you're probably not the only one. Below are three of the less common symptoms of menopause. Some people describe this as a feeling of bugs crawling all over your skin, or perhaps a burning sensation like an insect sting. You could say that this sensation may "bug" you. In the majority of cases, the tingling is harmless, but very annoying. It's possible the tingling is a symptom of some other less common problems, including anxiety, panic attacks, back pain, a herniated spinal disk, poor blood circulation, diabetes, heart disease, stroke, arthritis, multiple sclerosis, carpal tunnel syndrome, or a tumor. Please contact a doctor if you're concerned about any of this health problems. If you find yourself experiencing unexplained tingling that affects an entire side of your body or is accompanied by muscle weakness or tension, you should see your doctor immediately. An increase in aches and pains throughout the body - as well as sore and stiff muscles - is another less common symptom during menopause. In general, this symptom occurs when you're suffering from nutrient deficiencies or poor health. This means it can be relatively easy to alleviate. Exercising regularly can help boost endorphins, the body's natural painkillers. This may help improve moods and reduce many physical and psychological PMS symptoms. Also, try and eat a healthier, more balanced diet, rich in protein, calcium, and potassium. Some women feel electric shock sensations, a feeling similar to a rubber band snapping in the layer of tissue between skin and muscle. This may be related to the effect of fluctuating estrogen levels on nerve tissue. It can also be the precursor to a hot flash. Like things struck by lighting, they often heat up after. As with all menopausal symptoms, if you're concerned, it's important to talk to your doctor. 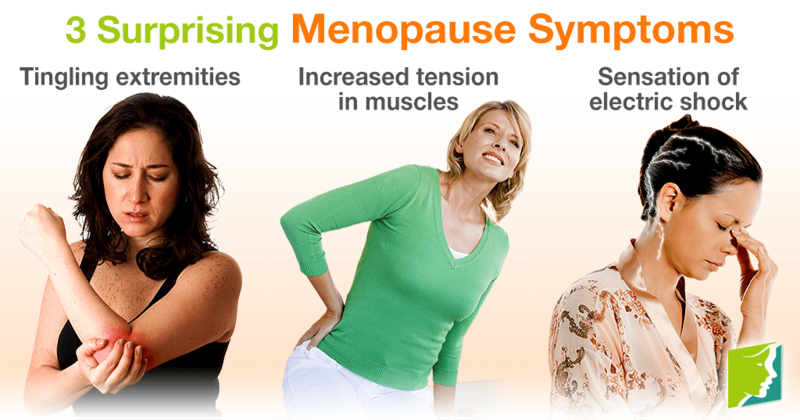 If you want to learn more, click on the following link about menopause symptom treatments.